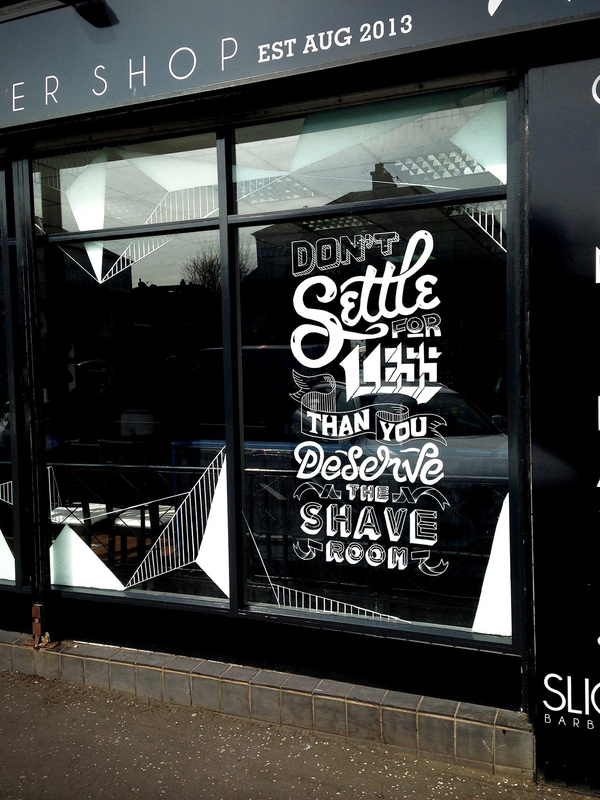 former football player that decided to soccer in the field of typography, Scottish born graphic designer, letterer and typographer Craig Black is known for his bespoke and innovative typography, visual identities, installations and murals. Having spent the first few years of his career in leading design agencies gaining experience in print to motion and everything in-between, Black runs his own design studio in London from where he explores a varied mix of projects with local and international clients of all business backgrounds. Known for his versatility Black’s work has been celebrated and published internationally by Computer Arts, Creative Review and IdN Magazine — in addition to regular features by online media. Here he talks with TYPEROOM on anything that keeps him inspired and more. My career didn’t start off as straight forward into design, I previously had a career as a professional football player. When I was growing up, football was all I thought about but simultaneously I spent my time drawing football boots, strips, badges, etc so without realizing, I was already working on my true passion. Years later, design became more important to me and I decided on a career change and studied design at The University West of Scotland. Thereafter, I was hooked on design and through a lot of hard work, continually challenging my abilities and not being afraid to fail has led me to where I am today. Do you consider yourself a graphic designer, an illustrator, a typographer or an artist? I consider myself to be all of these as I love the versatility in the work that I do, I would never wish to narrow myself to just one. I like to be able to adapt to any circumstance whether that would be an illustration, branding, crafting a new typeface or creating a large scale mural. I believe the key to success is having versatility. Your murals are carefully crafted. How much time do you spend working on your projects? It really all depends on the client’s deadline. I do believe that one of the most important factors to any project is having a meticulous research and planning stage and meeting my own internal deadlines, this ultimately results in a successful project. I don’t think I’ve ever had a project that hasn’t had some bump in the road but if I have everything in place to the best it can possibly be, then it’s a little bit easier to adapt to these situations. Please guide us through the creative process. I always start by thoroughly researching the brief, leading to mood boards to get the ideas flowing. As the mind ticks, I start to sketch a lot of ideas down and then narrow it down to more successful routes. When a concept is decided, I then take it to final stages whether thats by hand or digital depending on the specifics of the project for final completion. I like to involve the client in the creative process, leading to an exciting collaboration process rather than having boundaries of a client/designer relationship. What’s the difference between working for a leading design agency and running your own studio? Within a leading design agency, obviously the first difference is having a full team around you whenever that moment of uncertainty occurs, help is on hand instantly but the biggest difference is the responsibility levels. In a leading agency, there is a large team to delegate different roles and now that I am running my own studio, I am combining all these roles into one. I am enjoying learning about the full picture of combining design and business from project handling and business management to the decision making of a creative director and the hard graft of a junior designer. It’s a fast continuous learning process with high rewards if you work hard enough. How important is the bespoke aspect in your work? I think it is very important to have a bespoke design in order to give products that individuality and authenticity. In a saturated market, the aim is to make a product/project stand out from the crowd and to identify why a consumer chooses to buy that product or opt for that certain brand. Having a deep understanding of the brief and exploring avenues you might not even have thought of at first could be the key to that unique spark that a project has. Your portfolio is versatile. From innovative typographic illustrations through visual identities to packaging and installations there doesn’t seem anything you don’t manage. Which artform is your favorite and why? Personally, I like to craft things by hand, whether thats drawing a typographic illustration on paper or projecting it onto a large wall. I love the tactile feeling, getting close to the medium with each touch and move I make, inevitably becomes part of the whole design. For me, I enjoy the process and overcoming challenges just as much as the finished article. Who is your favorite typographer/mural artist of all time and why? A huge inspiration of mine in the French designer, Alexis Taeib also known as Tyrsa. I love his affection to lettering and typography, he is always so versatile and adapts to any brief. He aims for originality in his work with engaging visuals but always keeps a core of reinventing the letter without losing it’s meaning or beauty. These are fundamentals that I believe in. How important is the handcrafted element of your art in a digital world? With an increasing surge in handcrafted designs, I believe it has a huge part to play in a digital world. I feel this element can create a better connection between the product and consumer. There can be a more authentic feel to a design when created by hand, people also like to see the little imperfections, it creates that ‘humane’ feel that can get lost in a digital world. I have only recently started my own design studio and everyday is a school day, so my aim is to continually grow as a designer and as a business man. I want to continually push outside my comfort zone and work with different techniques and skills I may have not encountered yet. My plan is also to gain more experience by collaborating further with both designers and the public. I am currently working with secondary schools to create murals across Scotland to raise awareness of the creative industries not only to young people but the wider community. This is something that I am hugely passionate about. What is the best way to say goodbye to this conversation? Never say goodbye… I hate goodbyes! Keep in touch!